Born with a star for a horn, Kirika is like no other unicorn. In dreams. At the end of the rainbow. Where fallen stars meet. That’s where you’ll probably catch a glimpse of Kirika: the star of the night and most of the day. Kirika is also only 3-inches tall, so she packs a punch, as the smallest unicorn ever to be found. 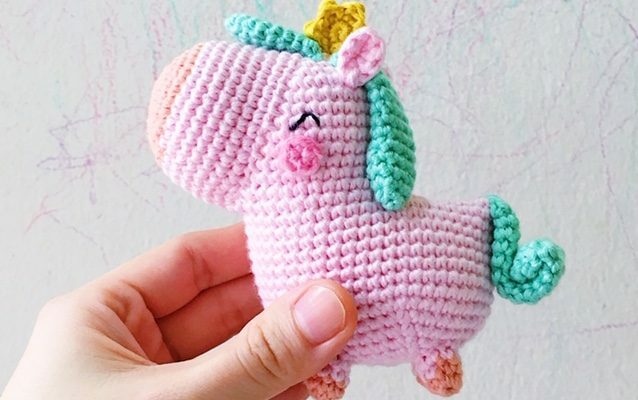 Our FREE pattern will let you make Kirika the pocket unicorn (it won’t take you more than 2 days — and that’s a unicorn promise!) just in time for Christmas, perhaps as a stocking stuffer surprise? Mix and match any of your favourite colours — we like the pastels from the La Mia Cottony range. 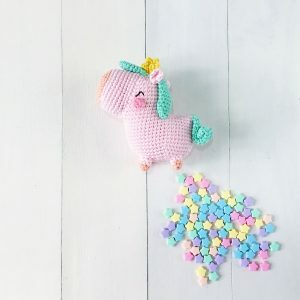 To download the pattern, click HERE! 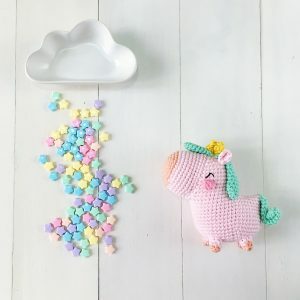 The muzzle directions in the pattern are incorrect. The increases for the muzzle should stop at 30 stitches and the rows should stop at 13. The muzzle is too big with 36 stitches. If these adjustments are made, then the muzzle will fit to the body.